John Barber. 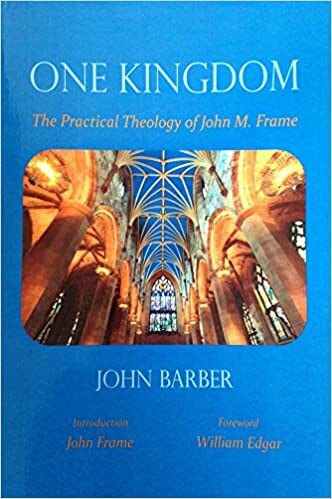 One Kingdom: The Practical Theology of John M. Frame. Lakeland, FL: Whitefield Media, 2015. 346pp. Disclaimer: Although I have never personally met the author, we have been friends via social media for several months. When I heard that his book was being published, I offered to write this review for him. Barber then explores the implications of this sentence throughout the course of the book. The material is arranged topically, beginning in Chapters 1-2 with the meaning of “lordship” in Frame’s theology. Readers of Frame will be quite familiar with his principle of tri- or multi-perspectivalism, which he derives from the three lordship attributes of control, authority, and presence (CAP), developed most fully in his Doctrine of the Knowledge of God (P&R, 1987). Each of these attributes likewise corresponds to a methodological “perspective” on theology: the situational, the normative, and the existential. Barber argues that Frame’s use of perspectivalism is rooted in his understanding that all theology is practical: theology is “the application of Scripture [normative], by persons [existential], to every area of life [situational]” (8). This commitment to the comprehensive application of Scripture has sometimes set Frame at odds with the strict confessionalists within the Reformed tradition. This is seen, for example, in Frame’s comparatively flexible understanding of the regulative principle of worship (RPW), and in his repudiation of any sacred/secular dualism. On the other hand, it also sets Frame at odds with more liberal theologians such as Abraham van de Beek, former professor of Systematic Theology at the Free University of Amsterdam, whom Barber selects as a foil for Frame in Chapter 2. The contrast with van de Beek serves to underscore Frame’s orthodox credentials, although I suspect that most of Barber’s readers will not have heard of van de Beek before. In Chapters 3-5, Barber examines Frame’s teachings on ethics, especially as elaborated in his Doctrine of the Christian Life (P&R, 2008). Barber shows that ethics stands rightly at the center of Frame’s theology; indeed, “All theology, then, has to do with ethics” (74). This is one area where Frame’s perspectivalism proves quite useful. Frame argues that all non-Christian ethical systems are reductionistic and parasitic upon Christian ethics. For example, Kant’s deontological (i.e. “duty”) ethics reflects a narrow reliance upon the normative perspective, but leaves out the situational and existential perspectives. But a fully biblical ethic will integrate all three perspectives (82-84). This is also why, according to Barber, Frame implicitly rejects a separation of the world into sacred and secular realms. If theology is the application of Scripture by persons to every area of life, then it follows that no area of life is exempt from Scripture’s authoritative claims. In other words, nothing is “secular.” Barber ties this to Frame’s non-traditional understanding of RPW, which rests on the distinction between the elements of worship (those things explicitly commanded in Scripture, such as prayers and sacraments) and the circumstances of worship (those things left up to personal discretion, such as the time of the worship service; cf. WCF 1.6). Although many Reformed traditionalists have understood this distinction as justification for a division between sacred and secular realms of life, Frame argues that even the circumstances of worship are holy and spiritual (143). This has a twofold effect in Frame’s theology: it allows for greater Christian freedom inside the church, and it gives greater voice to Scripture outside the church. For the Christian, all of life is sacred, and thus all of life is to be guided by the light of Scripture, but not regulated beyond what Scripture itself requires. Or as Frame states, “The regulative principle for worship is no different from the regulative principle for the rest of life” (144). In Chapters 6-8, Barber evaluates Frame’s presuppositional approach to apologetics. Frame has often acknowledged his debt to Reformed apologist Cornelius Van Til, whose thought he boils down to two points: “All men know God but suppress the truth in unrighteousness, and the only way to approach them is to pull the rug right out from under them” (175). However, Frame’s concerns differ from many Reformed theologians today, who are often more preoccupied with defending a particular method of defending the faith. Frame, on the other hand, focuses primarily on using apologetics as a tool for evangelism, in line with his interest in the practical nature of theology. In this respect, Frame is willing to use logical proofs and evidences to commend the faith, similar to classical apologists (such as Ligonier Ministries). According to Barber, where Frame differs from classical apologists is “not over the use of reason, but over the role of reason” (209). That is, Frame desires to treat Scripture as the highest standard for evaluating truth claims; it cannot be subordinated to human reason. This is due to the fact that unbelievers suppress not only the evidences for God, but also the very criteria for judging such evidences. Nevertheless, Frame is more willing than Van Til to grant that unbelievers can possess true knowledge of God, despite their rebellion. In the final section of the book, Barber examines Frame’s views on lordship and culture. Frame can be classified as a “transformationist,” closely aligned with the thought of Abraham Kuyper (although Barber points out that Frame is closer to Herman Bavinck and Klaas Schilder than to Kuyper). That is, he understands the authoritative claims of Christ to touch upon all of our cultural activities. This is precisely where Frame’s “one kingdom” approach confronts head-on the popular “Reformed two kingdoms” (R2K) perspective associated with some of the faculty of Westminster Seminary California in Escondido. According to R2K, the Christian’s life is divided into two spheres (corresponding to the sacred/secular distinction mentioned above), and each sphere operates according to a different set of norms. The sphere of the church is uniquely under the purview of Scripture, whereas the sphere of culture operates according to the norms of “natural law” (as understood in the classical Aristotelian/Thomist tradition). Frame, on the other hand, allows for no compartmentalization of Scripture’s authority. Further, Frame acknowledges (contra Van Til) that unregenerate man can know elements of the natural law, but he cannot consistently and rightly use this law apart from a Christian worldview (286). This is why Frame holds to the necessity of Scripture in the church’s public witness. However, this is not the same as theocracy; Frame writes, “Our motive is not to try to make non-Christians live the Christian life, but simply to work out the implications of our faith in all areas of life” (318). Although Barber’s appraisal of Frame is mostly positive, he does reserve space for some minor critiques. For example, Barber disagrees with Frame’s identification of God as the “cause of sin,” although Frame has carefully and repeatedly clarified what he means by this statement (71, note 81). He also questions Frame’s understanding of persons as “revelations” of God (101-103). And he suggests that Frame ought to explore more the discontinuities between congregational worship and the rest of life, in addition to the continuities (145). In all, I was quite pleased in reading One Kingdom, and would highly recommend it. However, I ought to give the reader one caution. I do not think I could rightly call this book an introduction to Frame’s thought. The language is highly technical, and much of the material assumes a prior knowledge of key figures in the history of philosophy and theology. In fact, there are many portions of the book that read more like a dissertation than an introduction. So if one is looking for an accessible point of entry into Frame’s thought, I can recommend no better source than Frame himself—and I suspect that Barber would agree with me on that. But if one desires to gain a deeper understanding of Frame’s unique contributions to systematic theology—as well as of the points of comparison and contrast with other modern theologians—then One Kingdom is an excellent resource. WOW! I LOVE THIS! Great post!